First step is heading over to Spotify-HTC.com. 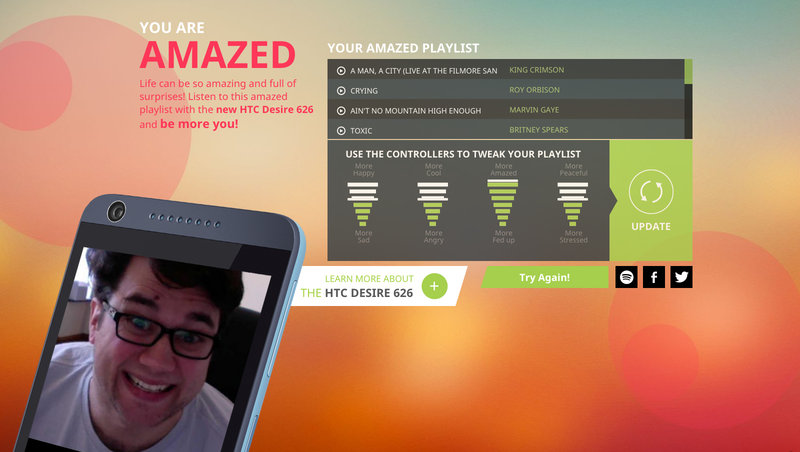 You’ll immediately see a splash screen, telling you to “be more you” with the HTC Desire 626 and Spotify. Click the big red “create your playlist” button to begin. 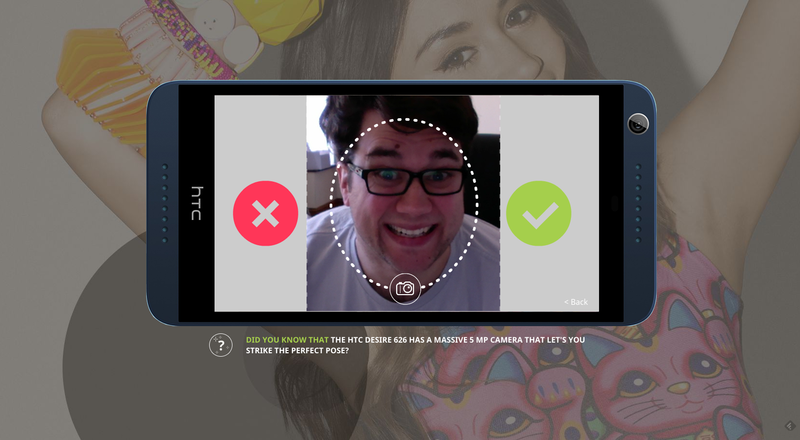 If you didn’t know that the HTC Desire 626 has a “massive 5MP camera”, you do now. Taking a picture, however, is easy. If you don’t want to use your computer’s built-in webcam, or you don’t have one, you can just add any picture stored locally. If you want to mess with it, upload pictures of animals instead, and see what happens. I decided to be boring and just take a selfie there and then. This is my ‘I’m trying to smile, but I’ve only had one coffee today so far’ face. Once you’re happy with your image, click on the big green check mark, if not, hit the ‘X’ and try again. 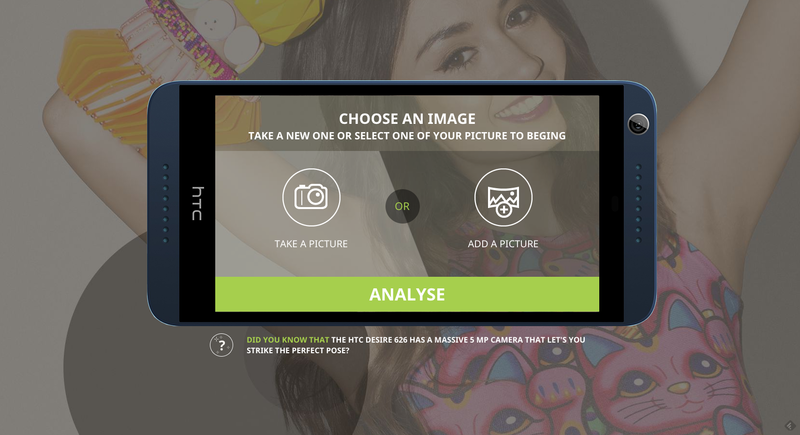 While the clever web-bot is busy ‘analysing your selfie’, HTC thinks it’s the perfect time to play a short video clip, telling you once more how amazing the HTC Desire 626 is. Skip the video, or wait until it’s done, and you get your result. I can honestly say I am amazed. Not at the accuracy of the emotional expression detection, but more because I genuinely think this is the first time I’ve seen King Crimson and Britney Spears in the same playlist. If you’re not happy with the list, you can tweak some of the emotion sliders and hit ‘update’. It’s a pretty fun feature, and is definitely a novel and new way of getting a new list of songs to listen to. As much as I might be snarky, I genuinely think this is fun and definitely worth a few minutes of your time. If you don’t want to take HTC’s word for it that the Desire 626 is a great device, you can always check out our review (video below). It’s a decent handset overall and good value for money, although it does have its faults. It’s currently available to buy unlocked for just $235 in the US and £285 in the UK.